Lemon balm is a hardy perennial that attains a height of 2'. It closely resembles the mints in appearance and cultural requirements. The leaves are heart-shaped and light, bright green. The flowers are an inconspicuous yellow or white. The entire plant has a strong lemon scent. This herb can be propagated by divisions made in the spring or early fall. Start plants from cuttings or seed (very slow). Space plants 2' apart. 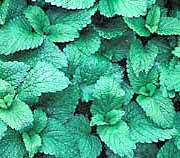 Plant lemon balm in a well-drained, partially sunny area. Harvest for drying just before the flowering stage; leave 2" — 3" of stem above the ground. Like its mint relatives, lemon balm can be invasive in the garden, especially if allowed to set seed. A good plant to add to a border. It is not a good specimen plant because it only looks like a mass of coarse green leaves. Lemon balm is used in herb teas and as a garnish in iced beverages. You can also add a few leaves to a lettuce or fruit salad for a pleasantly subtle flavor. The dried leaves are added to potpourri. Harvest the lower leaves in late summer for the best fragrance. The use of herbs is a time-honored approach to strengthening the body and treating disease. Herbs, however, contain active substances that can trigger side effects and interact with other herbs, supplements, or medications. For these reasons, herbs should be taken with care, under the supervision of a practitioner knowledgeable in the field of botanical medicine. No side effects or symptoms of toxicity have been reported with lemon balm use, but this herb should not be used by pregnant or breastfeeding women.